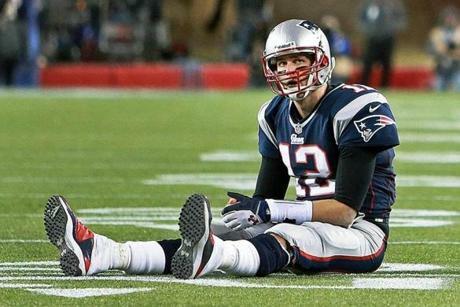 End of the line for Tom Brady in Super Bowl appearances? At one point it appeared likely that the two greatest Irish American quarterbacks of their generation, Matt Ryan of the Falcons and Tom Brady of the Patriots, would meet in Super Bowl 47. That was when the Falcons had jumped out to a 17 point lead against the 49ers and looked to be cruising. Meanwhile Brady’s Patriots were favored to defeat the Ravens at home, leaving a mouth watering clash of two great quarterbacks as the story of the Super Bowl. It was not to be. The 49ers, despite being 1-27 in games where they trailed by 17 points, staged a magnificent comeback, helped, it has to be said, by two huge blunders by Ryan, one an interception, the other when he bobbled a snap and San Francisco got the ball. Still we thought, Tom Brady will surely do the necessary at home against the Ravens who lacked the kind of explosive offense that usually gets teams to Super Bowls. Not to be however, as Brady fell asleep in the second half and the Ravens had 21 unanswered points. The demise of the two quarterbacks raises important questions about their future. Legend though he is, the chances of Tom Brady making it back to the Super Bowl grow dimmer with each passing year. He has become one of those quarterbacks who looks good in the regular season but fails to shine in the playoffs. The same could be said of Ryan, who had a spectacular regular season but made critical mistakes in the play off game today. At least Ryan has youth on his side and Atlanta will have learned a lot this year. Brady on the other hand is reaching the point where his skills will inevitably decline. We may have seen the last of Tom Brady ever making it to a Super Bowl. Ryan has a shot but he needs that clutch Brady ability which the New England quarterback had at his height. Both men will be watching from home this year -- a huge blow for them. Truth be told the future looks a lot less bright for them both after yesterday’s results.